There was never a question of “if” it would happen. The only was question was “when?” Any NFL football fan knew that sooner or later a “replacement” referee would make an incorrect call that decided the outcome of a game. That time was this past Monday night when the Seattle Seahawks came away with an improbable victory over the Green Bay Packers due to the referees not calling a clear penalty on the last play of the game and making an error in judgment in the call they did make. The way NFL leadership has handled the referee lockout and the use of replacement referees offers several interesting lessons for leaders in any industry or organization. Talent trumps – The NFL underestimated the gap in skill levels between their regular referees and the replacement referees, most of whom have only worked low-level college games or even just high school games. The replacement referees have had excellent attitudes and a willingness to work hard, learn, and improve. Those are critical traits for any successful employee. However, the simple fact is that they are literally out of their league when it comes to having the skills and knowledge to work in the NFL. In his book Good to Great, Jim Collins emphasizes the importance of “getting the right people on the bus” and then leveraging their strengths to “drive the bus” (your organization) to its destination. Because of the way the NFL managed the lockout, the most qualified college referees were already locked into their conference schedules, so the NFL had to utilize people who weren’t qualified for the job, and as a result, their performance has been sub par. The number one rule for a leader is to hire the right people for the job and the NFL clearly deserves a penalty flag for this violation. Training is necessary, but it shouldn’t be used to “fix” people – The NFL invested a tremendous amount of time, energy, and money in training the replacement refs on how to work in the NFL. They conducted rules clinics, refereed pre-season games, and have had weekly conference calls to evaluate their performance and work on improving their weaknesses. People can learn new skills and sharpen their existing abilities, but the purpose of training isn’t to “fix” people. Ken Blanchard and Mark Miller share a wonderful saying in their book The Secret – What Great Leaders Know and Do: “No matter how long the runway, that pig ain’t gonna fly.” Many leaders invest an incredible amount of time and resources into giving flying lessons to people who are never going to fly. Leaders have to be willing to accept the fact that there are some things that certain individuals will never learn to do well. Your people are your brand – NFL leadership prides itself on managing its brand image. They are fond of talking about their efforts to “protect the shield” (the NFL logo) through efforts such as controlling illegal drug usage, player health and safety, and encouraging upstanding player conduct off the field. Yet they’ve willingly compromised their brand integrity by using under-qualified referees which has put player safety at risk and resulted in a sub-par product on the field. The individuals that operate your organizations and interact with your customers are the living embodiment of your company’s brand image. The focus must always be on serving the customer and delivering on your brand promise. When people don’t perform, leaders need to look in the mirror – Whenever you have an employee who is failing in their job, you need to examine what you did or didn’t do to contribute to the situation. Referencing back to the previous points, did you hire the right person? Have you provided the correct amount and type of training? Have you clearly established the goals and performance standards and provided the specific direction and support needed? Too often we rely on our ability to make the right hiring choice and then just turn the person loose to do the job. People may have very relevant transferable skills, but there are always new things to learn or new ways of doing familiar tasks that have to be mastered. NFL leadership has no one to blame but themselves for the performance of the replacement referees. The Monday night debacle ended up being the tipping point that drove the NFL and referees to reach a tentative agreement late last night that will end the lockout. The NFL may have succeeded in exerting their power and proving to the referee’s union who is really in charge, but in the process the league fumbled this leadership opportunity and damaged their brand integrity. Randy Conley is the Trust Practice Leader at The Ken Blanchard Companies and his LeaderChat posts appear the last Thursday of every month. For more insights on trust and leadership, visit Randy at his Leading with Trust blog or follow him on Twitter @RandyConley. In the section headed “Training is necessary, but it shouldn’t be used to ‘fix’ people,” you said, “leaders have to be willing to accept the fact that there are some things that certain individuals will never learn to do well.” What I inferred from that included that you implicitly posited that the locked out “regular” officials possess some magical, mystical abilities, traits, DNA, or something that transcends their ever having to have needed “fixing.” In form, it reads quite a bit like “leaders are born, not made” So, please cite the evidence that led you to believe that the locked out refs never, as individuals, performed as poorly as the worst showing replacements, at some points in their NFL careers. While you’re at it, please cite the evidence that demonstrates that it wasn’t the same types of training, rules clinics, practice games, and conference calls that helped to transform them from poorly performing refs to the shining stars who still make egregious calls, from time to time. If you can’t do that, then if I were you, I’d rethink my position on social eugenics, regardless of what Blanchard and Miller’s theoretical work had to say. . Thanks for seeking clarification. I don’t believe in the concept of leaders being “born” and not “made.” It’s not an either/or condition; it’s a both/and. We all have a certain ceiling that we will reach in terms of our performance with a certain skill or ability, and that ceiling is determined by a myriad of complex factors (personality, learning styles and ability, innate talent, environmental conditions, access to education, etc.). If that was NOT the case, then all of us could/should be world class athletes, musicians, scientists, academics, etc. From a leadership perspective, the point I was making is that if you don’t have the people with the skills, talents, and aptitude to excel in their given roles, no amount of training is going to be able to “fix” them from being an average performer into a stellar performer. The simple fact is that the replacement referees just don’t have the skills and abilities to perform (at least currently) at the same level as the professional referees (who still make mistakes given their level of expertise). … and my point is that it took the locked out refs much longer than six months to hone their skills in order to excel at what they do. Therefore, we really can’t say with any certainty (at least with any credible certainty) whether any of the replacement refs have “the skills, talents, and aptitude to excel in their given roles” or if they’ve “reached their ceiling,” as compared to the locked-out refs. Since the basic factor of maturity in the actual work differs so greatly between the replacements and the regulars, I suggest that maturity mediates the relationships between “personality, learning styles and ability, innate talent, environmental conditions, access to education, etc.” (as predictors) and success (as the outcome) on just about any jobs that require the use of judgement. For example, no one could have predicted with any certainty, when Eisenhower served as an average 2nd Lieutenant that he would eventually become the stellar Supreme Allied Commander. 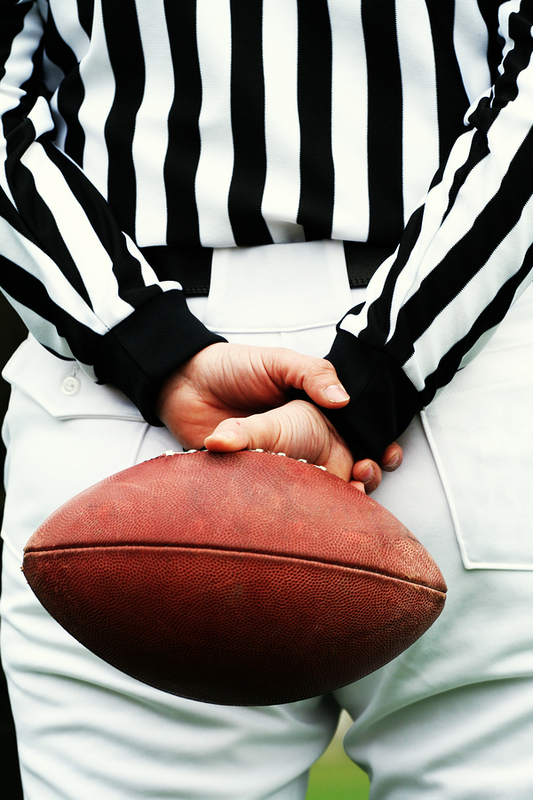 Bottom line: you wrote as if you know for sure that none of the replacement refs have “what it takes” to make it in the NFL – both in your initial post and more so in your reply. However, the fact is that we don’t presently know nor will we likely ever know how far their potential ceilings extend. By the way, aren’t you glad that some writer didn’t judge your potential as “lacking” or having reached your “ceiling” during the first six months of your tenure in efforts that led your best successes and greatest achievements? Wouldn’t you have found those words rather presumptuous? This was a tremendously poor error in judgement by the NFL powers that be. First of all they used an antiquated bargaining style of really low balling the refs causing polarization early. Next their preparation for the strike was completely flawed from the beginning. The NFL and goodell have become arrogant and think that witholding money from the key to their product which is well trained officials was a great financial strategy. The fan, coach and player revolt is like nothing I have ever experienced before…. a complete lapse of leadership that will never be forgotten. I agree Dr. Shoemaker. It seems as though NFL leadership underestimated the potential negative effects and were being penny wise but pound foolish. Thank-you for a nice article. Thank-you for helping!